* Please Note * Online Registration has closed for this event as of 11:30am on 8/22/17. Team Registrations are currently SOLD OUT and there are only a couple of remaining hole sponsorship opportunities available. Please call 406.995.3000 or e-mail margo@bigskychamber.com to secure remaining spots. 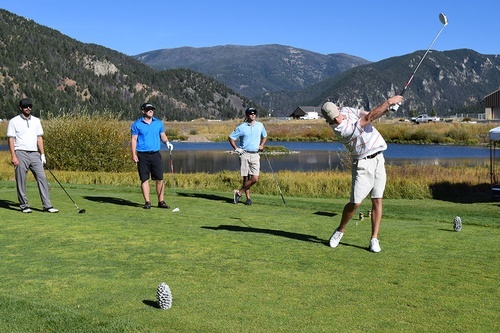 The 21st Annual Big Sky Chamber Golf Tournament will be held on Friday, September 8, 2017 from 11:00 a.m. to 8:00 p.m at Big Sky Resort’s Golf Course. The tournament was started in the early ‘90s to support economic development in Big Sky which continues to be the goal today. Funds raised support the operations of the Visitor Information Center and general operations of the Chamber, whose mission is to support the development of a world-class resort community as Montana’s premier location to work, live and play. Participants will enjoy contests such as a hole-in-one opportunity, longest drive, longest putt and closest to the pin for an opportunity to win great prizes. Winners will split a $1,000 payout and players will have a chance to purchase 50/50 raffle tickets. Cost is $395 per team or $110 per player and includes 18 holes, cart, range balls, dinner following golf, contest prizes and awards. The average attendance at the tournament is 120 including golfers, sponsors, volunteers and other guests.